You might be surprised if you took a walk around our orchard and nursery. There are no long rows of the same plants with bare dirt and drip irrigation. This is our home, our family grows our trees and spends our days playing in the same dirt. The kids sandbox, made from the granite foundation blocks of an old barn, sit next to rows of small trees and plants. Our chickens work each summer towards building the soil for next year’s trees. The annuals grow along side perennials and the orchard looks more like a forest invading an old farm than the straight rows and tightly-mown grass you’re used to seeing. The trees and plants we grow thrive because of the piles of composting wood chips. The soil that is teaming with worms and the multitude of supporting plants that we have growing among them. This living soil is worlds away from the dirt found in most nurseries and we believe that it grows our trees to be stronger, healthier and more resilient. 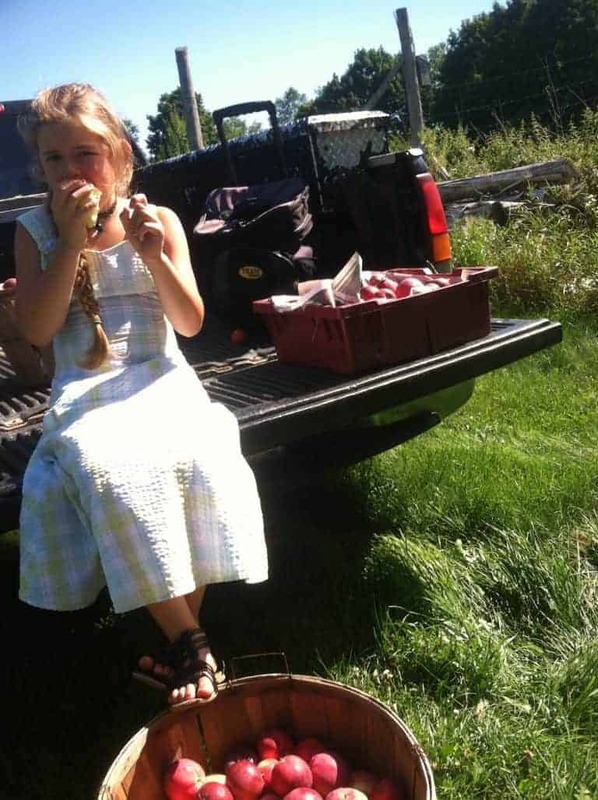 Our children can roll around the ground on our farm, play nerf guns among the trees and pull a carrot to eat straight from the dirt without one worry on our part. 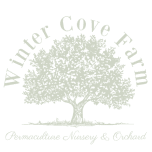 At Winter Cove Farm, we are proud to be part of a growing community that puts our children, our community, our land, and water before profits. successfully grow cold hardy fruit trees without poisons. choose carefully selected varieties and provide a step-by-step system to care for them. We live in a Zone 5 and personally test each of the varieties that we offer. Ensuring they will grow in a challenging environment. 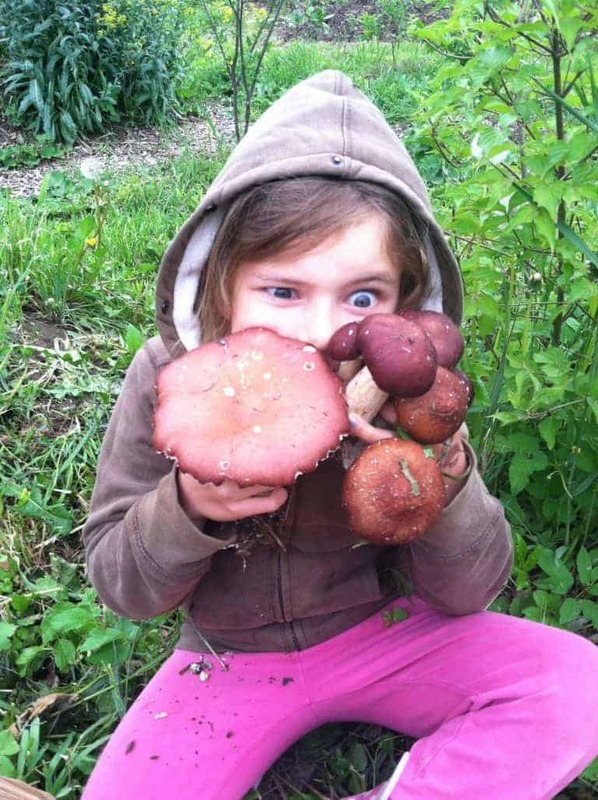 We work with beyond organic principles, concentrating on soil health and balancing the ecosystem. We’ve found a way to grow healthy, nutritious food, within an ecosystem, without using man-made chemicals, intensive management or doing damage to the environment. We teach others how to do the same whether you have 1/10th of an acre or 100 acres. We do this through our classes throughout the growing year and in our online information. 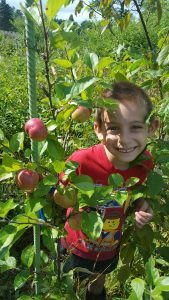 We believe that we are meant to be in community, working together to create regenerative orchards and food security throughout our communities working towards the restoration of the earth and the people within it.